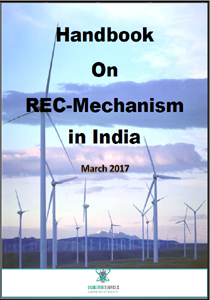 The report titled “Handbook on REC Mechanism in India” will provide the complete overview along with minute details of REC mechanism in India. As it was a major step in direction of the development of Renewable energy. It helps to promote the development of Renewable energy sources in states where the potential of the Renewable energy is very low in form of “REC” i.e. Renewable Energy Certificates. In last 7 years, there are significant changes in the field of the renewable energy. The cost of installation of major renewable Energy installation has come down drastically. Which lead to competitive scenario in the field of the Renewable Energy. Under this report we will discuss the various trends, parameters to discuss about the renewable energy certificates. Including the trends of development of RE sources, Trends of REC price in last 7 years, details of Inventory status of the REC. We will also see the details of states promoting the renewable Energy through REC Mechanism. With overall RE–installation through REC mechanism. In this report, we can see the source wise RE installation. The overall idea of this report is to give the complete idea of REC-Mechanism along with its present status. It also includes the details of order released by CERC on the new REC price and other prices. •Firms interested in the REC – Market in India.